Vanua Levu, formerly known as Sandalwood Island, is the second largest island of Fiji. 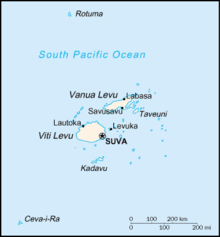 Located 64 kilometres to the north of the larger Viti Levu, the island has an area of 5,587.1 km² and a population of some 130,000. Geologists believe that Vanua Levu is an amalgamation of several islands that melded through successive stages of uplift. The main part of the island is roughly shaped like a tall, thin triangle 30 to 50 kilometers in width and 180 kilometres in length, rotated so that the point is to the northeast. This point, the northernmost in the Fiji chain, is Udu Point. From the southeastern side of this triangle, a long peninsula stretches out into the Koro Sea. The island is surrounded by coral reefs, and is rough and hilly. The island is divided horizontally by a rugged mountain range, which forms much of the boundary between the Provinces of Cakaudrove and Macuata. The highest peaks are Mount Batini, also known as Nasorolevu, with an altitude of 1111 meters, and, 16 kilometers further north-east, Dikeva, also known as Mount Thurston, with an altitude of 1030 meters. Vanua Levu’s main mountain ranges lie near the windward, southern coasts, making them much wetter. Northern Vanua Levu, by contrast, is dry eight months of the year, enabling sugar cane, the island’s major crop, to thrive there. Vanua Levu has a number of rivers, including the Labasa, the Wailevu, and the Qawa. These three form a delta on which the town of Labasa stands. None of the island’s rivers are navigable by large vessels.